Anyone who knows me knows I HATE the pumpkin spice trend. It is everywhere! You can’t escape it, you can’t hide. I have seen it in coffee, coffee creamer, cream cheese, chips, tea, chocolate bars, air fresheners, personal care products (really, REALLY personal), whipped peanut butter, and in mass produced cookies of all kinds. It starts showing up sometime in September and doesn’t go away until mid-December. I think, as a trend, it is overdone – the shark has been jumped – and it is time to move on to the next big thing (which I will complain about, too, just for the record). So, you may wonder why my latest recipe is pumpkin? 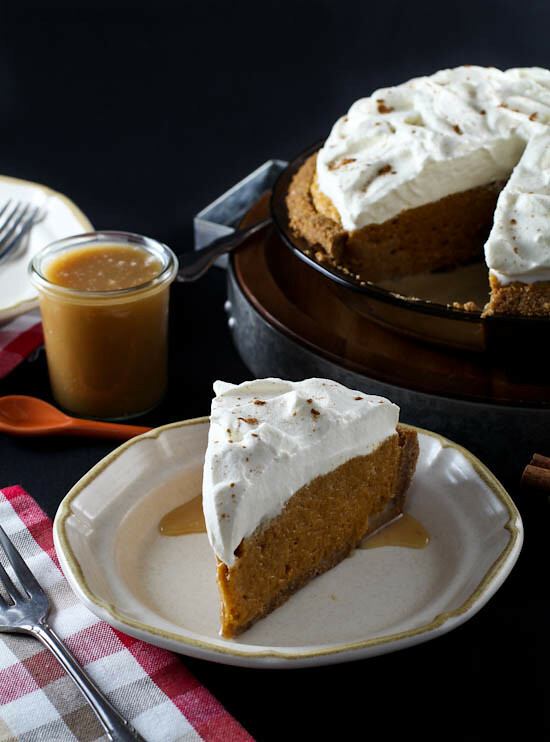 Because pumpkin spice is always appropriate in a pumpkin pie! Furthermore, pumpkin pie is always appropriate in November. 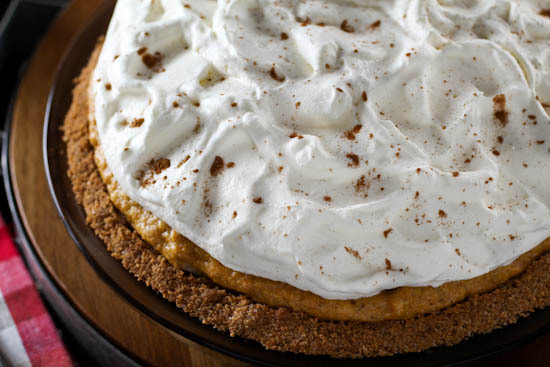 This pie is my take on my mom’s holiday tradition – pumpkin chiffon pie. She makes pumpkin chiffon pie for Thanksgiving and Christmas. It is lovely and light, and she serves it in her famous flaky pie crust. It is perfect after an enormous meal. 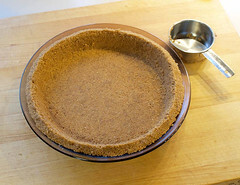 My take adds some salted caramel sauce and a cinnamon graham cracker crust to add a little more richness and texture. It is still light as air, but it has a little extra ‘oomph’ on the flavor department. 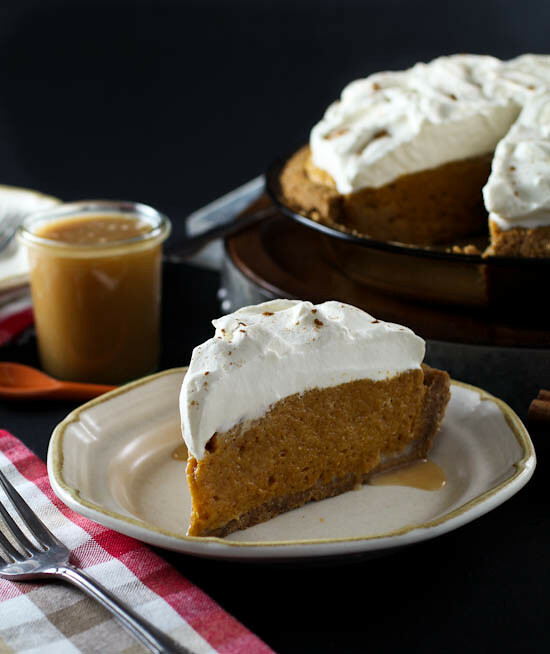 You can make this pie the night before you plan to serve it, but do not make it too far in advance or the caramel sauce will get too runny. The sauce will run from the slices, creating a sweet puddle on the plate, which I loved. This pie is really best one to two hours after making it. The good news is you can make the components a day or two in advance – the pie crust and pumpkin fluff – and all you need to do is whip the cream and assemble the day you plan to serve. For the salted caramel sauce I use this recipe. If you have a particular recipe that is your favorite please feel free it use it here. You can also add a drizzle of sauce to your plate for a little fancy garnish. Go nuts, it is the holidays! 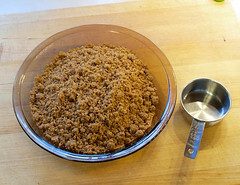 In a medium bowl combine the graham cracker crumbs, sugar, and butter. 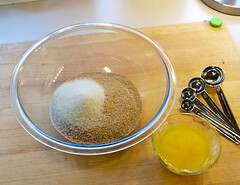 Mix until the crumbs are evenly coated. Pour the crumbs into a 9-inch pie pan. Using a measuring cup, press the crumbs into the pan tightly. Bake for 10 minutes, then remove the crust from the oven and cool completely to room temperature. 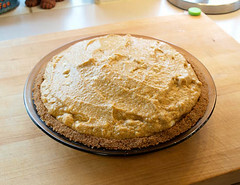 Once cooled, spread the salted caramel sauce into the crust. Cover and chill for at least 1 hour or overnight. In a small bowl combine the gelatin and the water. Allow to stand until completely bloomed, about 10 minutes. 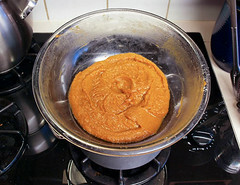 In a medium saucepan combine the sugar, ¼ of the salted caramel sauce, egg yolks, cornstarch, salt, cinnamon, allspice, cloves, nutmeg, and pumpkin puree. 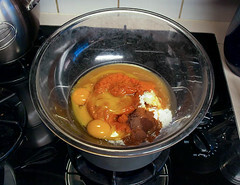 Cook over a double boiler, whisking constantly, until thickened, about 10 minutes. Remove from the heat and add the gelatin and vanilla. Mix until well blended then allow to cool to room temperature. In a large, clean, bowl whip the egg whites with the salt until they are very frothy. Gradually add in the remaining sugar, beating constantly, until the whites form medium peaks, about 2 minutes. 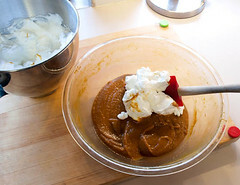 Working in thirds, fold the egg whites into the pumpkin mixture, making sure no large streaks of egg white remain. 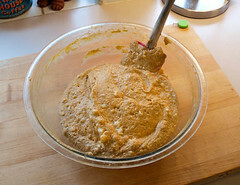 Pour the mixture into the prepared crust and chill until firm, about four hours. Once chilled prepare the whipped cream. In a small bowl mix the powdered gelatin with the cold water. Let stand 10 minutes, then melt in the microwave for ten seconds. Allow to cool for five minutes, or until cool to the touch. In the work bowl of a stand mixer, or in a large bowl with a hand mixer, add the cream, powdered sugar, and vanilla. Whip on medium-high speed until it starts to thicken. Slowly pour in the cooled gelatin and whip until the cream forms medium peaks, about 2 minutes. 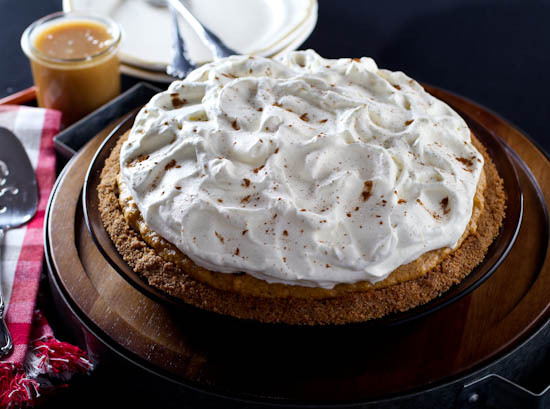 Spread the whipped cream over the pie and garnish with cinnamon, if desired. Chill for 1 hour before serving. © 2014 – 2016, Evil Shenanigans. All rights reserved.